Each dolphin creates its own signature whistle in the first few months of life and then swims around announcing themselves so others learn it. WILD BOTTLENOSE DOLPHINS design unique signature whistles to identify themselves, and they answer when a close cohort calls them by name, researchers said today. A study of 200 bottlenose dolphins off the eastern coast of Scotland found that they are the only non-human mammals to use the names of those in their close circles to get each other’s attention. “It is the first evidence we really have of naming and labeling in the animal kingdom,” said lead author Stephanie King of the Sea Mammal Research Unit in the School of Biology at the University of St. Andrews in Scotland. “I think it draws some quite interesting parallels between dolphin and human communication, which is something people had thought was the case but hadn’t been experimentally proven until now,” she told AFP. Scientists have previously found that each dolphin creates his or her own signature whistle, or name, in the first few months of life. Then, they spend a lot of time swimming around and announcing themselves. About half of a wild dolphin’s whistles are its own signature whistle, King said. But King and her co-author Vincent Janik wondered what would happen if a dolphin heard someone else calling out his or her signature whistle. So they recorded a group of dolphins and played back the sounds of their name whistles, one by one. “Interestingly, the animals would only respond and only react when they heard their own whistle,” said King, whose study appears in the Proceedings of the National Academy of Sciences, a US journal. Researchers tried different ways of playing back the sound, both by preserving the voice of the dolphin and by stripping all voice features so it would sound like another dolphin calling out a specific name whistle. They also played control whistles of unfamiliar dolphins from different populations, as well as the signature whistles from the same population. “When an animal hears a copy of its whistle it will call back, it will reply very quickly and it doesn’t do that for any other whistle type,” said King. Other animals, including songbirds, bats and parrots, have been shown to be capable of copying sounds in their environment and developing a distinctive repertoire of calls. But only parrots and dolphins use labels that they have learned for other objects or creatures. 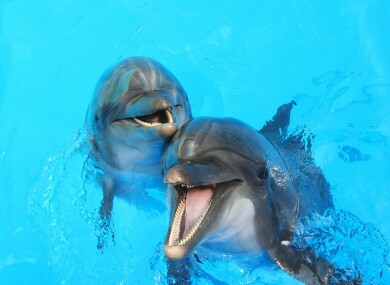 King said her research shows that dolphins call each other by name in their own social circles, such as between mother and calf or from one male friend to another. “Animals are really using this when they want to reunite with a specific individual,” said King. Since dolphins appear to be whistling their own names about half the time, the next big question is to figure out what else they are talking about, said King. Email “Study finds dolphins use names to call each other”. Feedback on “Study finds dolphins use names to call each other”.